Outcome of ISL recognition debate in the Seanad. On Wednesday 22 January, the Seanad voted against the second stage of the Recognition of the Irish Sign Language (ISL) Bill. Senator Mark Daly from Co. Kerry presented the Bill with support from the Irish Deaf Society and the Irish Deaf community. Senator Daly said, "As citizens, the members of the deaf community must be guaranteed the same rights and access to services as everyone else. Sadly that is not the case." After the debate, Senator Daly said "I am disappointed with the final vote of Tái (yes) 21, Níl (no) 24 in the Seanad yesterday evening (Wednesday). I will continue to work on the issue of the Recognition of Irish Sign Language as I feel it is an important matter." This aim of the bill was to ensure equal rights for the deaf community in Ireland and would guarantee that the government no longer continues to breach the Good Friday Agreement. The main provisions of the bill were: To require public bodies and government departments to implement action plans for ISL; To permit the use of Irish Sign Language in Legal proceedings; To provide for regulations of ISL interpreters; To establish the Irish Sign Language council; To provide for the establishment of registers. For more information on the campaign, go to www.healthinsurancesavings.ie or www.facebook.com/IrishSignLanguageRecognitionCampaign?fref=ts. 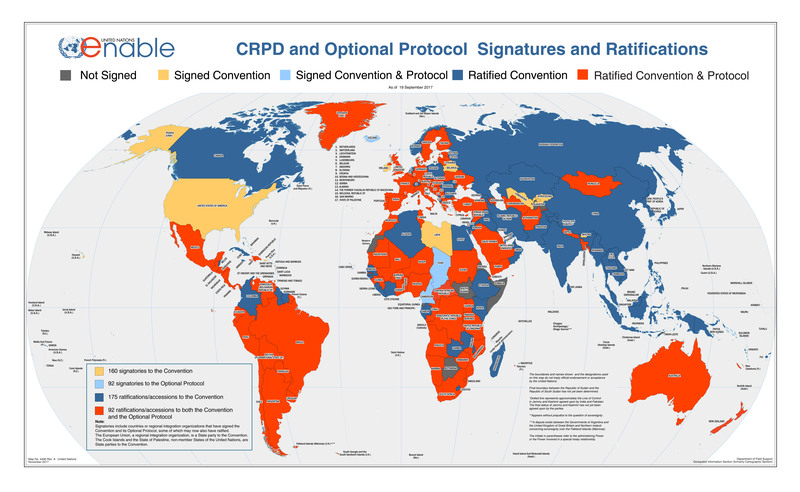 UN convention on the rights of persons with disabilities. In the absence of official recognition of ISL, the UN Convention on the Rights of Persons with Disabilities (CRPD) strongly promotes sign language, reasonable accommodation measures and full and effective participation and inclusion in society. On 18 December 2013, the HSE Service Plan announced it has provisioned for 3.2 million euro for bilateral and simultaneous cochlear implants for children. This is a result after a long campaign by parents and their supporters. The funding will enable the implementation of a bilateral (simultaneous) and sequential cochlear implant programme in Ireland. In the future, children will be fitted with two implants or a 2nd implant if they already have one. Assessments will be carried out to ensure children meet criteria set down by the Cochlear Implant team in Beaumont Hospital. Online resource launched for parents, professionals, and policymakers in Deaf education. While we are on the topic of deaf children, a new online resource has been launched in the USA to provide objective, evidence-based information for policy-making practice related to raising and educating Deaf children, in order to improve them. Although the website, is based in the USA, it's still relevant to the Deaf community here. Its aims are to reach all parties concerned e.g. professionals, families and policy-makers, to get the best possible opportunities and futures for deaf children. Quarterly eBulletins will reflect the most current issues. The 6th World Congress on Mental Health and Deafness, organised by the European Society for Mental Health and Deafness, will be held at Queen's University, Belfast from 16 - 19 September 2014. The theme will be the relationship between human rights and mental health of Deaf people. All delegates are invited to submit proposals for presentation (25 minutes including 5 minute Q&A) by 8 April 2014. At least one presenter must be registered with the congress by the review date in order to make a submission. Irish Sign Language, British Sign Language and International Sign Language interpreters and Speech to Text Report will be provided. There has been talk of increases to health insurances premiums and this may have an impact on the Deaf and hard of hearing individuals. If you are renewing your cover, check out the following: www.hia.ie or www.healthinsurancesavings.ie. Craft classes and social get together. Our craft classes and social get-together have restarted after our Christmas break. Christina O'Donoghue will run the classes every Thursday from 2-4.30pm. This will be your opportunity to learn new arts and craft skills & participate in game sessions such as jenga and cards. There will be plenty of time too for chat and tea and coffee. Irish sign language (ISL) apps. Are you interested in learning sign language? Do you have a smart phone? Is so; information on ISL can be downloaded via Apple and Android apps. The following are available on the Apple app store: Irish Sign Language Mobile App Lite by Paddy O'Neill (free); Irish Sign Language Mobile App Sign4Life by Paddy O'Neill (cost 0.99 cent); SignBasic Mobile App by Ziggiapps (free), and ISL Alphabet by Incremental Systems (free). The following Android apps are available on the Google Play store: Concise Irish Sign Language Dictionary (free); SignBasic Mobile App by Ziggiapps (free); and Irish Sign Language (Freemium) by Sign4Life, (free). Irish sign language on the internet. Abbey Theatre, Dublin - the Risen People. The play, The Risen People, will have a sign language interpreter for their performance on Thursday 23 January at 7.30 pm. The play is about the 1913 lockout in Dublin where employers tried to break the workers by not allowing union members to work. The play is a sell out, but the Abbey Theatre hold special seats for Deaf on that night, so if you are interested you need to book quickly. Information officer vacancy Deaf Village Ireland CIS. Dublin North West Citizens Information Service is currently seeking to recruit a part-time (17.5 hours per week) Information Officer assigned to Deaf Village Ireland. The candidate must have Irish Sign Language and be able to communicate verbally in English. Applications must be submitted by post, on the relevant application forms (four typed copies) with covering letter to: Marianne Healy, Administrator, Dublin North West CIS, Unit 1B Village Centre, Finglas Village, Dublin 11. (Quoting reference: DV/DNW on envelope). Closing date for receipt of applications: 4.00pm Friday 31st of January. It is anticipated interviews will be held on 10th of February. Late or incomplete applications will not be accepted. Marriage preparation course for the Deaf. Interpreters will be provided at a marriage preparation course, organised by Accord, which will be held at the Deaf Village Ireland, Ratoath Road, Cabra, Dublin 7. It will be held on Friday, 21 February from 8 - 10 pm and Saturday, 22 February from 10 am - 4 pm. The cost per couple is €120 and includes a light lunch and refreshments. Irish Deaf Women's group - "Little party 2014"
Just a reminder that full payment is due by 22 February for the International Women's Day dinner to be held at the Radisson Blu Hotel & Spa, Lough Atalia Road, Galway on Saturday, 8 March at 7 pm. This is a five course meal, wine and spot prizes. Members €40 and Non Members €45. Post payment to: Gaye Regan / Bernadette Walsh, Irish Deaf Women's Group, Deaf Village Ireland, Ratoath Road, Cabra, Dublin 7. To book accommodation, please email: ethan.brennan@radissonblu.com. Signs of a Diva starring Caroline Parker is a performance, which includes signed songs, audio description and captioned text. The production is by Nona Shepphard and Directed by Jenny Sealey and can be seen on Tue 18 Feb at 8 pm in Axis Ballymun, Thurs 20 Feb at 8 pm in An Grianán Letterkenny, Sat 22 Feb at 8 pm in Ballina Arts Centre, and Tue 25 Feb at 8 pm in Mill Theatre Dundrum. Sign language interpreted programmes on RTE. Since October 2013, RTE have been providing three hours of Irish made programmes through Irish Sign Language every Wednesday night. Catherine White & April Drew both from Co. Kerry have been two of the on-screen interpreters for a number of the aired shows. Support for survivors of residential abuse. Many Deaf people in Ireland received compensation through the Residential Institution Redress Board (RIRB). The RIRB has changed its name to CARANUA. CARANUA will offer survivors support, information, advice and advocacy; enhanced access to publicly provided services and grants to avail of services in health, education and housing. In Ireland it will also work with statutory bodies to improve their capacity to understand, recognise and address the particular needs of survivors arising from their adverse childhood experiences. CARANUA will be responsible for improving the health and well being of survivors of institutional abuse who received awards through the courts or the RIRB. Funding for its services and activities comes from a fund of 110 million euro committed by religious congregations. CARANUA is committed to using these funds to the best benefit of survivors. International sign language interpreter vacancy with EUD. The European Union of the Deaf (EUD) is currently looking for an experienced International Sign interpreter to provide interpretation and translation for the INSIGN project team throughout the full duration of the project, in particular to the EUD Executive Director. The INSIGN proposal intends to give response to the European Parliament decision of 10-13 December 2012 for the implementation of a Real Time Sign Language Application and Service, following an evident need as there is currently no direct communication access for deaf or hard of hearing citizens to Members of the European Parliament and administrators of the institutions of the European Union and vice versa with deaf or hard of hearing person inside the EU institutions. Centre for deaf studies information night. On Wednesday 22nd of January at 7.30pm, the Centre for Deaf Studies (CDS) will hold an Information night in the Green Room, Thomas Mahon Building, Deaf Village in Dublin. First deaf-blind student at Harvard law pursues dreams. At fifteen-years-old, Haben Girma had skied, kayaked, cycled, danced, and travelled to Mali without her parents. That's a lot for any teenager, but Haben was doing all those things while deaf and blind. On behalf of our Board, staff and members, we would like to wish all our clients, customers and supporters a very Happy New Year. Hope you all had an enjoyable Christmas. We will reopen on Monday the 6th of Jan 2014. New part time staff member. We would like to welcome Frances Woodley to our CE team. Frances will work as a PA to our Manager. We hope this will free up our Manager and enable him to be more available for client appointments in particular for our sign language user clients. Frances will work with us from Wed-Friday. Frances has a hard of hearing daughter and we hope this experience will be of benefit to her in her role in our service. Services and funding in 2014. At this stage we have not been informed of any funding cuts for 2014. If our funding is cut again, we may need to review our current service allocation. However, we will continue to strive to provide a range of services to our Deaf and hard of hearing clients and customers. Top up payments to disability and charity organisations. The media continues to examine funding to disability services in light of the fiasco surrounding top up payments to senior personnel in the Central Remedial Clinic (CRC) and other disability organisations. Unlike bigger disability services, our service receives only 89,000 euro per year from the HSE. With growing demands for services, our service is continuously being stretched and there is very little hope of increased funding in the foreseeable future. We welcome the media investigations and fully support their work. This work needs to be carried out. Otherwise the work of the disability, voluntary and community sector will continue to be undermined in 2014. The Deaf Community Centre (DCC) in Limerick has re-advertised two CE positions. The closing date for applications for the Deaf Community Officer & Development Officer positions is Friday 10th January 2013. To submit your CV or to request further information, you can email: Haaris Sheikh, Director at haaris@dcclimercik.eu or hr@dcclimerick.eu. The European Union of the Deaf (EUD) is offering out new internships in 2014. The internship is aimed at Deaf sign language users who want to gain valuable experience at European level. EUD will cover the intern's transportation costs to and from Brussels and pay a monthly allowance of €800. The internship will be matched to the candidates' profile: it will either focus on media and communication or policy work, or a combination of both. Work will include attendance at events at various European institutions, and the General Assembly in Athens, Greece, as well as media and film work. Depending on the task and the intern's skills and interests he or she will report to the Policy or the Media & Communication Officer. Sympathies to family of Marina Egan. We would like to extend our sympathies to the family & friends of Marina Egan, a former committee member of the Kerry Deaf Club who passed away suddenly this last week. Marina was a huge supporter back in the 1970's and 1980's and was part of a committee made up of parents of deaf children & supporters who secured funding to purchase the building where our service is now based. May she rest in peace.